Q4: Crunch time or time to relax? Sports fans know the fourth quarter is crunch time. With the game on the line and time running out, things get really interesting. The greatest and most memorable plays occur in the fourth quarter—often to win the game. In many games, the first three quarters almost feel like a scrimmage, with both teams playing it safe and waiting until it’s crunch time to elevate their performance. The level of play in the last quarter is unmatched earlier in the game. It’s the game within the game. In business, the fourth quarter (October, November and December) also should be crunch time, but often it’s not, especially in the green industry. It’s often a time to kick back. It’s a time for relaxation, vacations, holiday partying and basically coasting until January. After demanding spring and summer seasons, it seems perfectly natural to just take it easy for a while. What’s wrong with that? As you can see, there’s quite a contrast between the “leave it all on the field” sports analogy and the “foot off the pedal” approach many landscape companies take in the fourth quarter. Perhaps these are two extremes and there’s some middle ground that needs to be found—a place where there’s both a time for rejuvenation and focus on finishing strong. I think so. There are many things to focus on in the fourth quarter. Financials and tax planning are on this list. Strategic planning retreats are commonly scheduled during this time of year, which leads into preparing goals, budgets and tactical plans for the upcoming year. Companies that invest in these areas in the last quarter are poised to hit the ground running in January, while their counterparts may be hibernating during the late fall and winter months. The most progressive companies take it one step further. They spend the fourth quarter focusing on making improvements in their operations, like reducing inefficiencies, implementing industry best practices and tightening process documentation. There is no hibernation period for these leaders. A new season is coming soon, and they’re taking advantage of Q4 to get ready. For them, it’s crunch time. Even the smallest improvement in an operational process has the potential to make a significant impact on the bottom line. This is due to the multiplication effect of the process being repeated throughout the season hundreds, if not thousands, of times. Think about it. If a process change resulted in the savings of only $20 a day per person, a three-person crew working a 30-week season would save $9,000 for the season. If this company had 10 crews, it would save $90,000 for one season. Benchmarking studies are a great way to uncover potential operational improvements. By comparing a specific company’s information to others in the same industry, you can discover new insights, root out inefficiencies and implement more cost-effective methods. A classic example is in the area of equipment maintenance and repair. Companies that hold on to old, junky equipment have much higher equipment costs than others. They also have more disgruntled employees and unhappier customers. However, they believe that getting one more year out of a 10-year-old mower will save them money—until they see the benchmarking study and realize their equipment costs are way out of line. Once the realization sinks in, they’ll embark on a journey of learning what industry best practices are, discovering cost calculators and putting changes in place. Comparing actuals to benchmarking study results produces powerful information since it allows a company to see beyond its own four walls. Comparisons to last year or to budget are important, but they are completely internal in nature. By comparing to other companies in the same industry, additional insights are revealed. 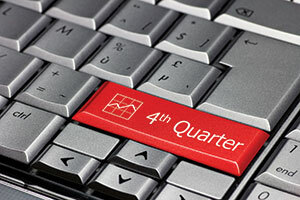 So, with the fourth quarter approaching, what time is it going to be—crunch time or hibernation time?